Grilled Chicken Drumsticks is the delicious juicy starters and absolutely loved by all non-vegetarians. My son is a big fan of this dish. This is always on his request menu at home or even at restaurants. This is so easy to prepare with such less ingredients and taste is just TOO GOOD. Just the basic few ingredients and I am sure this is gonna be a hit in your family. Prepared this on my hubby's birthday. 1. 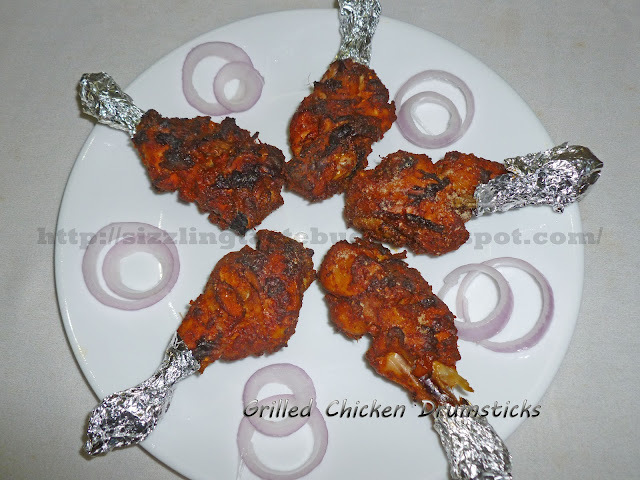 Make some cuts on the chicken drumsticks and keep aside. 2. Make a paste of all the above mentioned ingredients and apply it to the chicken pieces, also apply some between the cuts you just made. 3. Marinate it for atleast 6 hours. This is the reason to get those delicious chicken which you might have tasted in the restaurants. 4. Place these marinated chicken pieces on a grill table and grill it till you get a nice golden color or till the chicken is cooked thoroughly. Turn in between to get the chicken cooked on other side too. 5. When done, sprinkle some chaat masala on it and serve it with onion and lemon pieces. Note: Don't skip the marination part. I didn't use any artificial food color to this. Its just the Red hot hot chilli powder. Try this dish this weekend and let me know how it tasted. I can't believe that it is so easy ..Bookmarked..